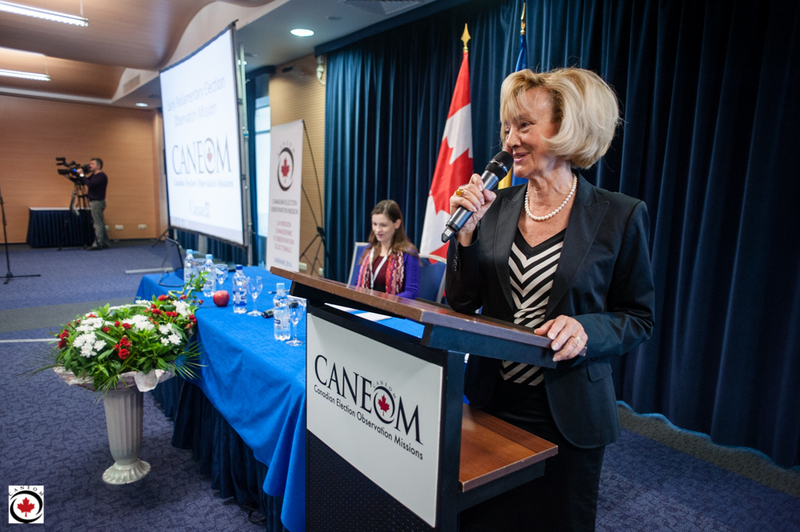 On behalf of the Government of Canada, CANEOM is recruiting Short term election observers to be seconded to OSCE for the November 30th 2014 Republic of Moldova parliamentary elections The deadline for application is the November 13th. STOs should arrive in Chisinau by Wednesday 26 November and depart by the 2nd of December. Observers should strictly abide by the OSCE/ODIHR Observer Code of Conduct and the deployment plan prepared by the OSCE/ODIHR EOM. The security and safety of observers is of the highest priority and will take precedence in EOM management, including the deployment plan. All observers will receive a security briefing upon arrival and are required to operate in accordance with security guidelines. The working language of the OSCE/ODIHR EOM is English. All briefings, debriefings and reporting will be conducted in English and all interpreters will work in local languages/English. All STOs must, therefore, have a good working knowledge of both written and spoken English. The application process is now closed. Shortlisted candidates will receive more information. Kyiv, October 27th, 2014 – The Canadian Election Observation Mission (CANEOM) today released its preliminary report on Ukraine’s early parliamentary elections which were held yesterday. 1) The preliminary assessment concludes that the democratic will of the people is reflected in the results of these elections, in accordance with the laws of Ukraine, and international laws and standards. 2) There were new challenges in these elections, compared with the last parliamentary elections in 2012, such as access to voting in the conflict-affected parts of the country and occupied Crimea, a large number of Internally Displaced Persons, and safety and security concerns. 3) The authorities generally enforced the law when faced with electoral violations. “We commend the people of Ukraine and the election administration for successful elections. The Ukrainian people worked hard under difficult circumstances to ensure that the outcome of these elections be a genuine reflection of the will of the Ukrainian people,” added Senator Andreychuk. The mission will be present in Ukraine until official results are announced, and will publish a full and final report in the near future. CANEOM deployed almost 200 observers to all regions of Ukraine, except Crimea where no elections were taking place. “We thank observers for their diligence, dedication, expertise and hard work under uncertain security conditions,” concluded Senator Andreychuk. The independent CANEOM mission is funded by the Government of Canada. KYIV, UKRAINE–(Marketwired – October 24, 2014) – Canada’s election observers have successfully deployed across Ukraine to observe the country’s parliamentary elections. Nearly 200 observers with the Canadian Election Observation Mission (CANEOM) will be monitoring the October 26th vote in all regions of Ukraine other than Crimea, where no voting will take place due to ongoing military occupation by the Russian Federation. Following several days of rigorous training in Kyiv, including sessions on international and domestic election law, Ukraine’s political landscape, and the principles of election observation, CANEOM observers will monitor the electoral process in the lead up to and on Election Day. The mission’s mandate is to observe, record and report, while in no way interfering with the electoral process as it unfolds. The mission expects to issue its preliminary report on October 27th. The CANEOM mission is funded by the Government of Canada. Speaking in Toronto on September 11, 2014 Prime Minister Stephen Harper announced that Canada will be sending an independent team of election observers to monitor the early parliamentary election in Ukraine, scheduled for October 26, 2014. The bilateral Canadian observation mission will see the deployment of 40 long-term (LTO) and 150 short-term (STO) observers to monitor these elections. Since 1991, Canada has invested considerable effort and resources in support of Ukraine’s democratic transformation, and during this time, Canadian election observers have monitored numerous presidential and parliamentary elections, and helped promote credible elections and adoption of internationally recognized best practices by Ukraine’s electoral establishment. This initiative builds on Canada’s tradition of assisting Ukraine’s ongoing democratic development through bilateral election observation missions. Most recently Canada deployed 38 LTOs and 100 STOs, through CANEOM, to observe early Presidential elections in Ukraine which concluded on May 25, 2014. The heads of mission for the May CANEOM mission, Senator Raynell Andreychuk and former Ontario Premier Mike Harris, presented the Prime Minister with the final observation report from the early presidential election. Canadian Election Observation Missions (CANEOM) is proud to contribute to this tradition through its engagement with the government of Canada – specifically, the Department of Foreign Affairs, Trade and Development. CANEOM is organized by the Forum of Federations, with support from Cuso International and the Ukrainian Canadian Congress. The mission is by the Government of Canada, and managed at arm’s length. CANEOM’s mandate is to organize and execute election observation and monitoring missions internationally. CANEOM will assess Ukraine’s electoral process in accordance with international standards, commitments and obligations for genuine democratic elections, including the OSCE’s Copenhagen Declaration of 1990 and other international human rights obligations. CANEOM subscribes to the Declaration of Principles for International Election Observers and Code of Conduct for International Election Observers that was commemorated at the United Nations on October 27, 2005, and endorsed by 42 intergovernmental and international organizations. In all of our mission’s activities, CANEOM pledges to adhere to all domestic laws, and to respect the core election observation principles of impartiality and non-interference.